After a mere three hours of sleep I spent most of today lounging about on the couch, attempting to nap, and just generally feeling miserable. It was a cold day so I put up the hoodie and grimaced like some sort of foul grumpy troll. By dinner time I was ready to snap out of this funk and get to work making something that would be delicious and hopefully not put me to sleep by 7:30 PM. I walked to the local butcher shop and picked up one of the largest duck breasts I've ever seen and a couple of Italian sausages. I was a little leary of buying this duck because it bore a striking resemblance to the worst duck I ever had. The worst duck I ever had was in Paris, of all places, and it was enormous and tasted like beef. It wasn't disgusting. In fact it was perfectly edible. It just didn't taste anything like duck. Also it was served with "five pippers." I'm still not sure what that meant. I sliced the duck skin all the way to the meat and seared it, skin side down, in a pan for a good 20-30 minutes to brown it up before tossing it into the oven with the sausages to cook. I seasoned it only with salt, pepper, and thyme. I had wanted a whole duck and some fresh herbs but since this duck breast was about the size of a normal whole duck I figured this would be enough. 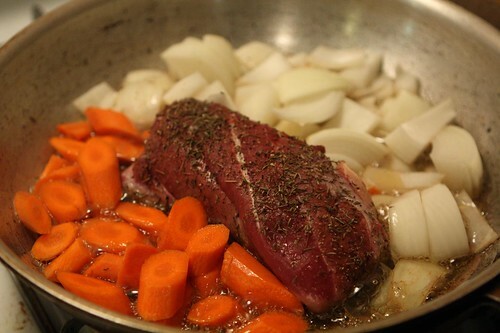 Since there was so much duck fat that rendered from the skin I tossed in some assorted carrots and onions that were in the crisper because what is better than vegetables roasted in duck fat? After throwing the crisped duck breast into the oven with the vegetables and sausages I made a quick creamy polenta with corn meal, turkey stock, cream, salt, pepper, and grated Parmigiano-Reggiano. 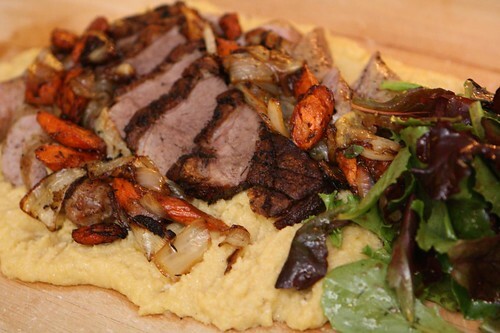 I poured the polenta onto a wooden cutting board and put the sliced roasted duck and sausage on top with some of the vegetables, juices, and a salad I tossed together with Jen's amazing salad dressing. It turns out that this duck tasted a lot like the duck from France. My suspicions were confirmed: large duck breasts just taste like beef. Next time I think I'll save myself the aggravation (and money) and just make a beef roast. To accompany this lovely little meal I popped open this bottle of Victor from Allagash that I picked up in Maine last month. 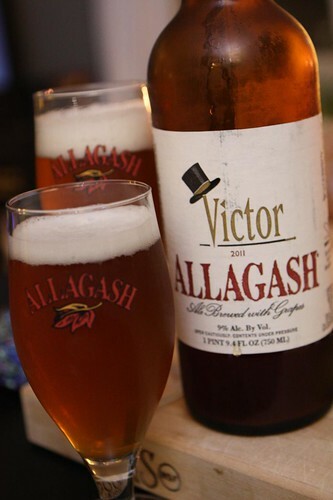 Victor is a Belgian strong ale brewed with red grapes and, in the manner of proper gentlemen, wears a top hat. I'd be lying if I said I bought this beer for any reason other than the fact that there was a top hat on the label. When looking at a whole wall of Allagash beers this was one of the clear winners. That being said, it turned out to be quite tasty too! It actually tasted a lot like a sparkling white wine, fruity and delicious, but not sweet. And now, given that it's almost 8:00 PM, I can fall asleep with little regret. Little regret other than the kicks I'll receive from the other side of the couch.